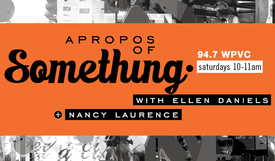 Apropos Of Something hosts Ellen Daniels and Nancy Laurence talk with James Coan PhD, Prof. of Clinical Psychology & Dir., Virginia Affective Neuroscience Laboratory, on why friendships are essential to good health; and Warren Craghead III, prolific artist and creator of TRUMPTRUMP vol. 1., on illustrating social commentary. Home Grown hosts Clinton Johnston and Leslie M. Scott Jones talk to local entertainment attorney, Elva Mason about a recent Department of Justice ruling that adversely affects collaborating songwriters, and Warren Craghead from Second Street Gallery talks about their next exhibit, Sonya Clark’s “Bitter, Sweet, and Tender“. 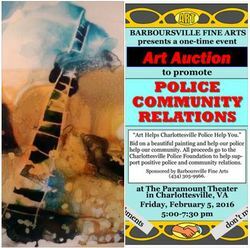 This week Home Grown hosts Clinton Johnston and Leslie M. Scott Jones talk to Warren Craghead, director of Second Street Gallery about their upcoming openings by artists Liz Rodda and Amie Oliver, and Hamid Karimi from Barboursville Fine Arts about their art auction fundraiser for police community relations.